Advent has a moving, double focus. We focus on the coming of Christ, both as he came, the babe of Bethlehem and as he promises to come again at the end of all things. The readings in church on this first Sunday in Advent made this clear, as we heard the challenging verses of Mark chapter 13 verses 24 to the end. This passage, in which Jesus speaks of the end of all things, but paradoxically calls his disciples to hope, is known to scholars as the ‘little apocalypse’, and its amazing how preachers manage to shy away from it whenever it crops up! This year I have tentatively begun a new sonnet sequence called ‘Parable and Paradox’ in which I am trying to reflect, as honestly as I can, on the teachings of Jesus as I hear them read to me over the year. So here first is the reading I heard on Sunday, and then the sonnet I have written in response. 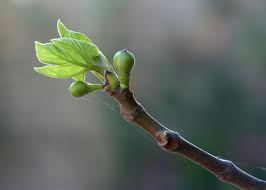 I was especially moved by the unexpected word ‘tender’, in the midst of all that apocalyptic imagery, when Jesus, in describing the signs of spring in a fig tree, says ‘its branch becomes tender and puts forth leaves’. With shadowed glimpses of apocalypse. How can we even start to understand? Of everything that we have ever known. The all-revealing climax of our story. But we must wake and watch for you, look up. To see the world’s end as a sign of spring.